This entry was posted in Substance Abuse and tagged Drug Detox, Help, Managing Symptoms, Signs and Symptoms on August 29, 2016 by Team Addiction Hope. Withdrawal is a frightening reality for recovering addicts. It can lead to chills, tremors, seizures and dozens of other adverse and potentially life-threatening effects. When your loved one has a drug or alcohol dependency, you need to recognize signs that he or she may be about to undergo withdrawal. Learning the early signs of withdrawal, such as the following five symptoms, enables you to help a loved one before it’s too late. In early signs of withdrawal from most substances, including opioids and alcohol, your loved one may exhibit behavioral changes. This may include increased or unfounded agitation, anxiety or depression. Later in withdrawal, these feelings can lead to full-on panic attacks. Your being aware can help them fend off a panic attack. If your loved one is using cocaine, for instance, these changes may be rapid as he or she experiences the “crash” phase. Call for help quickly before the early stages of withdrawal turn into acute withdrawal. Alcohol and drugs affect the brain, leading to feelings of euphoria or a “high,” and then extreme lows as the effects of the substance wear off. This emotional roller coaster can result in the addict having volatile mood swings. If your loved one complains of muscle cramps, abdominal cramps or headaches, these are all early signs of withdrawal. Headaches and cramping can come from either alcohol dependency or a drug use problem. As the body struggles to readjust to a system unaffected by substances, it can lead to dehydration and muscle aches. Ignoring these signs can make them increase in intensity before more acute symptoms appear. Driving your loved one to a rehabilitation center during withdrawal can help alleviate these symptoms by having him or her hooked up to an IV drip with fluids and medications. Depending on the severity of the drug or alcohol dependency and the type of substance used, withdrawal can lead to drastic health effects such as seizures or a coma. If you notice your loved one’s hands or body shaking, this is one of the earliest signs of withdrawal. Call for help as soon as you notice your loved one starting to shake, pant or sweat. Withdrawal from alcohol – and many other drugs – can cause insomnia, or trouble sleeping. If your loved one appears tired during the day, complains of having nightmares, or is up at odd hours of the night, he or she may be going through the early stages of withdrawal. If your loved one sleeps for days at a time, this may be a sign of a cocaine “crash.” Changing sleeping patterns can point toward the physical and mental distress that occurs when weaning oneself off a chemical substance. 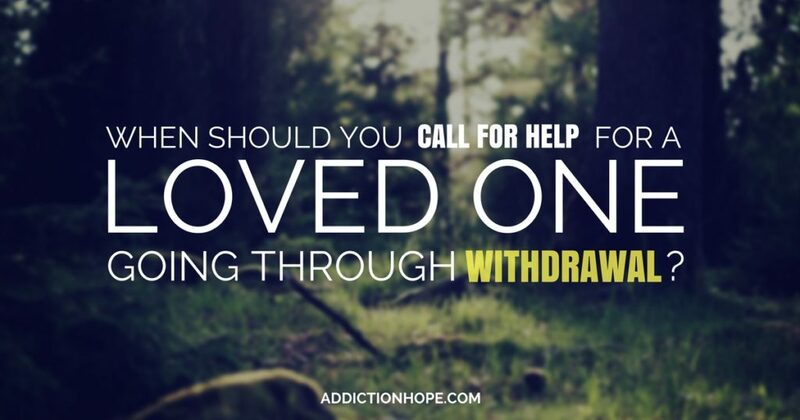 If you believe your loved one is in the midst of withdrawal, don’t hesitate to call for help. Your loved one will need special treatment that you cannot give. Withdrawal can be terribly stressful on the body and mind. Look for treatment centers in your area, or simply dial 911 if you think your loved one is at risk of developing more extreme withdrawal symptoms soon. Some withdrawals are life threatening. Your loved one needs proper detox to pull through the withdrawal phase comfortably and to begin the road to recovery. Do you know when the best time is to get your loved one the help he or she really needs while recovering from addiction? Please share your thoughts below.